We all know how beautiful our wild, unspoilt nature can be... and it's importance to our living planet Earth. But did you realise the speed at which man himself is damaging it's unique natural habitat? We are well on our way to destroy our forests, plants, wetlands; we are polluting our oceans and seas. This way, we're driving numerous animal species, plant species and many others into extinction. Everyone should be aware of the importance of our natural environment. Here you can read about the true value that forests, plants, wetlands, oceans and seas have for life on Earth. You'll find additional information about current and future threats to our natural planet, why we need nature to survive and how we can deal with the environmental problems we face. We are polluting the air in our atmosphere, resulting in increasing global temperatures. CO2 is the most significant gas in our atmosphere, which keeps planet Earth warm. The warming of the earth can bring several dangerous consequences like global meltdown of glaciers and polecaps, river floodings, spreading diseases, strong hurricanes and the loss of unique, irreplacable coral reefs. To solve these problems, we need to vastly reduce the production of greenhouse gases. We can do this by learning to recycle products and waste, by using more effective public transport, being a smart consumer and using alternative, renewable energy sources. Politics also needs to take action to change relevant legislation, laws and regulations that relate to global warming and climate change. The world's oceans and seas are threatened by overfishing, marine pollution and climate change. We need our oceans as the habitat for diverse species of fish and marine life, sea plants, sea birds and sea mammals. The ocean's produce of fish, seafood, minerals and energy make our oceans an important natural resource. Even coral reefs can help us provide things like medicine. To save the habitat of our oceans and seas, we need to reduce the number of commercial fishing boats, limit fishquota for endangered species, and ban damaging and wasteful fishing practices that threaten to wipe out entire species of sea life. Because of pollution, land habitats either disappear, or become less unique. Think ice and deserts. Our seas and oceans are in danger of pollution and overfishing. Pollution of our atmosphere by carbon dioxide is a main cause of global warming. Plants are threatened because of habitat loss, forcing many plant species towards extinction, no matter how important these plants are to us. They provide man, as well as animals, with food, shelter, clothing, medicine, and most of all... oxygen. To save our plants, we need to stop unsustainable logging, halt pollution, monitor plant collecting, and protect exotic and endangered species. 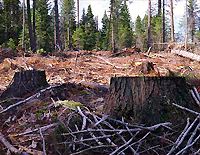 Forests are endangered because of industrial scale logging and other forms of tree cutting, which often leads to an enormous waste of smaller plants, trees and wood in general. Forests are vital to plants, animal species and human existence. They provide us not just with food and other products, but even more important is their role in absorbing carbon-dioxide. They even generate local employment and income. In addition, woods and forests offer a natural place for relaxation, recreation, and a spiritual and cultural base for many people. We also need to find solutions to stop deforestation. This means we need to decrease the use of unsustainable wood and start recycling timber and woodproducts. Timber can actually be used several times, for many different purposes. Organisations like Forest Stewardship Council sell wood with a trademark (FSC, and others). By buying such timber and wood, you ensure you’re using wood that comes from renewable and sustainable forests. Another kind of land habitat that's threatened with extinction are the world's wetlands. The main cause for their loss is uncontrolled economic development. We need wetlands as an important breeding ground for birds and other animals. Wetlands are vital to floodprotection, and function as a buffer against drought or saltwater intrusion. Wetlands also purify water supplies and recharge groundwater reserves. One viable solution to protect our wetlands is to renew certain natural and historical wetlands and bring them back to their previous glory.